Vittorio Jano’s latest creation, the long-promised Lancia D50, eventually materialized at the closing race of 1954, the Spanish Grand Prix at Pedralbes. The under-wraps production had been the hot topic of the paddock all season. Testing had begun in January and prior to each race the rumours would spread that the car was finally going to make an appearance, only to have it come to nothing. The grapevine whispered that Jano had designed a machine that possessed cutting edge technology, but was proving difficult to perfect. All of Italy hoped that it would be capable of competing with the might of Mercedes-Benz who so far had been leaving the rest of the field in their wake. Vittorio Jano’s engineering career had been long and productive. He joined Fiat as a junior draftsman and proceeded to work his way to the top until he eventually became head of the Fiat design team working alongside Luigi Bazzi. After Bazzi fell out with Fiat in 1923 and moved to Alfa Romeo he advised they hire Jano to help develop their uncompetitive Formula One car, the P1. Nicola Romeo, owner of Alfa Romeo, dispatched Enzo Ferrari off to Turin to track down Jano and offer him twice the salary to work for Alfa. It took less than a year for Jano to finish his stunning Alfa Romeo P2. After the P2’s first practice session at the 1924 French Grand Prix, gleaming silver in sunshine as it had not yet been painted in the traditional Alfa Romeo deep crimson, an Italian journalist wrote, “While waiting along the edge of the road with eyes pointed at the course, it seemed to us that a bullet had just passed us by. The silver car proceeded firmly on that imperfect surface, and the singing of the engine gave the impression of uncommon power.” The car won its first race, the 1924 French GP with driver Giuseppe Campari at the wheel, and Alfa Romeo’s four cars took out the top four places at the Monza GP – much to the delight of the local supporters. Jano’s next project was the Alfa Romeo P3 which also won its first race, though its most famous victory would be when Tazio Nuvolari drove it to victory at the 1935 German Grand Prix against the might of the Mercedes and Auto Union stables. In 1937 Jano had a dispute with Alfa Romeo’s general manager and deserted Alfa to sign up with Lancia as their chief development engineer where he spent many years designing their road cars. Vincenzo Lancia, an engineer, racer and test driver for Fiat, founded Lancia in 1906. After he died in 1937 his wife took over the running of the company, and then in 1947 his son Gianni Lancia, also an engineer and test driver, became president. Gianni Lancia had always had a passion for motor racing and after achieving instant success in sports car racing with first their standard 2-Litre Lancia Aurelia Coupe winning its class at the Le Mans 24 hour in 1951, and then their Jano designed D24 sports car which won multiple races, he decided the company had what it took to build a competitive Grand Prix car. They were fortunate to already have Vittorio Jano on the payroll – they just had to wait for his latest Formula One design! When the Lancia D50 finally appeared in Spain its innovative construction was immediately obvious. Frequently an engineer starts with what is already known and then works to improve it with small modifications and adjustments. The Lancia D50 was a clean-sheet design…Jano had completely rethought the physics and aerodynamics of his new model from the ground up to make it a breed apart from the rest of the field. Smaller, lighter and lower than the opposition, the engine was angled 12 degrees which allowed the propeller shaft to run to the left of the driver instead of underneath him. This then resulted in a lower centre of gravity as the driver was closer to the ground. Paniers between the wheels contained the fuel tanks, instead of being placed in the rear of the car as was usual. This concentrated the weight between the wheels and also improved aerodynamics. The car also contained Formula One’s first V-8 engine which was also a Jano design. Because it was shorter and squatter than the standard straight 6 and 8’s used by the competition it could also be load bearing. The engine was incorporated as part of the chassis which further lowered the weight of the vehicle (so why did I think that Colin Chapman‘s Lotus 49 was the first car to use the engine as a stressed member?) It had a rear gearbox that was likewise incorporated into the chassis. With the engine in the front, the driver and the fuel in the centre, and the gear box in the rear the weight was distributed between the wheels rather than in front of or behind them. This also affected the whole handling of the car. The Lancia D50 had significant weight over all four wheels which discouraged it’s propensity to slide the rear wheels. However when it did start to slide it was difficult to control and a spin often resulted. Reigning (and double) world champion Alberto Ascari had not been able to come to an agreement with Ferrari and had signed with Lancia for the 1954 season. 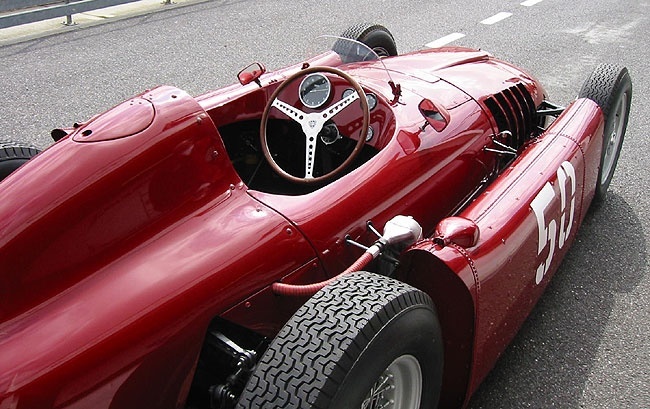 As their car was not yet finished he drove twice for Maserati – after the departure of Juan Manuel Fangio who had left for Mercedes – and once for Ferrari. Finally, the Lancia D50 was ready to show to the world and Ascari showed its potential by putting it on pole (a whole second faster than Fangio) for its inaugural race. He also set the fastest lap before having to retire on lap 10 when the clutch failed. For the 1955 season it was expected that Mercedes Benz with their W196 would have some long awaited competition with the new Lancia D50 being able to match it for speed. In the first race at Argentina, which still holds the record for the hottest Grand Prix on record, none of the three Lancias finished. Ascari qualified in 2nd with an identical time to Juan Manual Fangio but both of them were half a second slower than Jose Froilan Gonzales in the Ferrari. Ascari crashed on lap 21. Luigi Villoresi had a fuel leak on lap 2 and Eugenio Castellotti had an accident on lap 35. Fangio won the race over a minute ahead of the Ferrari in second, though he sustained such a bad burn to his left leg from his exhaust that he was left with a permanent scar. It was almost four months later that the next race for the season was held at Monaco. By now Ascari had taken his Lancia to victory in the non-championship rounds at Pau and Naples. Fangio and Ascari once again set identical qualifying times and the stage was quickly becoming set for a battle of reliability rather than speed. Stirling Moss was only one tenth behind them both in the second Mercedes. Fangio led at the start, followed by Moss in second until half distance when Fangio was forced to retire because of transmission problems. It was on lap 80 that Moss’s engine expired and Ascari inherited the lead. He was still on the same lap when his brakes failed going through the chicane and his Lancia crashed through the barriers and splashed into the harbour. He was very lucky to escape with only a broken nose. The race was eventually won by Ferrari driver Maurice Trintignant, the only race that season not won by Mercedes. The Monaco Grand Prix would be Ascari’s last race. Four days later he traveled to Monza to watch Eugenio Castellotti test a Ferrari 750 Monza sports car which they were to co-race in the Supercortemaggior 1000. On the spur of the moment he decided to drive a few laps and wearing his street clothes and borrowing Castellotti’s helmet he set off. It was on the third lap while going around the high speed Curva del Vialone that the car unaccountably skidded and then somersaulted twice. Ascari was thrown out of the car and died a few minutes later. Lancia had spent a fortune to enter Formula One, but it was now all falling apart. Faced with ever mounting debt along with the loss of their star driver, Alberto Ascari, they started to cave into pressure from their multiple creditors. What had looked like a dream come true with pole position at their first race and a competitive car against the might of Mercedes-Benz was now ending in a nightmare. However, things were not well in the world of Formula One. Two weeks after Ascari’s death there was the tragic accident at the 24 Hours of Le Mans when Pierre Levegh’s crash resulted in carnage in the unsuspecting crowd. The French Grand Prix was called off first, followed by the cancellation of the German, Swiss and Spanish Grand Prix’s. Several countries were threatening to pull out of car racing completely. At the end of the year Mercedes announced their withdrawal from all motor sport. Would there be a Formula One competition at all in 1956? Very interesting stuff. Thanks Jenny. Looking forward to part two. Because Colin Chapman told us!! – although the BRM H16 engine was used as load bearing in both BRM and Lotus designs using the engine. I used to admire Chapman but after the DeLorean revelations I am not so sure. Forgot to say in my original comment – excellent article much enjoyed reading about one of my favourite cars. Great read. Eagerly awaiting pt 2. Always had a soft spot for Lancia, my dad had one when I was a nipper. OK, I feel like I’ve been commenting too much so hopefully last one today. 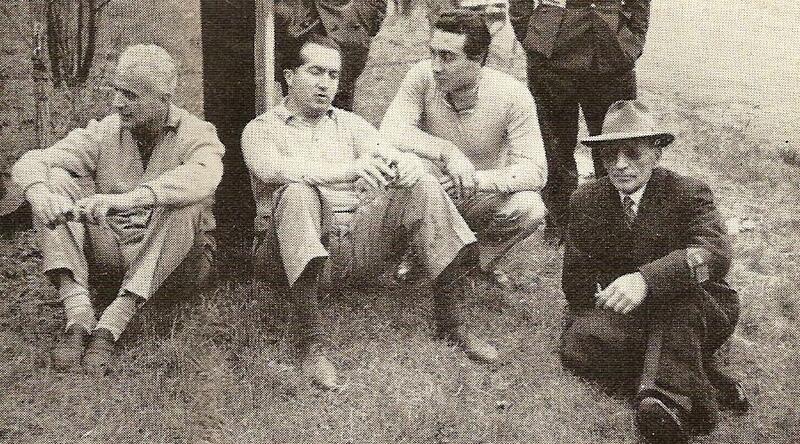 Here is a Spanish version of the Fangio documentary, for @Taflach! It’s not possible to comment too much:) Thanks for the video!